Cluck Old Bull by Steven Sherrill w/Harold Taddy Listen to more of his music here. 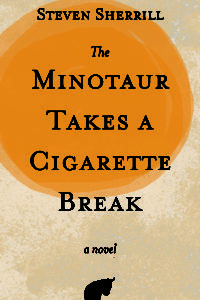 Sixteen years have passed since Steven Sherrill first introduced “M,” the selfsame Minotaur from Greek mythology, transplanted to the modern American South, in the critically acclaimed The Minotaur Takes a Cigarette Break. Since the book’s publication, it has been translated into eight languages. 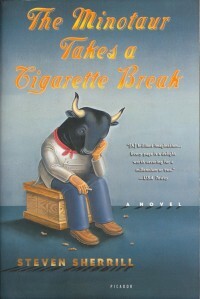 In 2011, Neil Gaiman selected this work of contemporary Americana as one of five books for his initial line of audiobooks for Audible.com’s “Neil Gaiman Presents.” The novel also made The Wall Street Journal’s list of the “Five Best Novels Not About Humans” and The Telegraph’s list of the “10 Best Food and Drink Books of All Time.” This fall, Steven Sherrill is bringing M back for a sequel. A collaboration between Steven Sherrill and musician Harold Taddy renders the Bull’s narrative through sound and song. 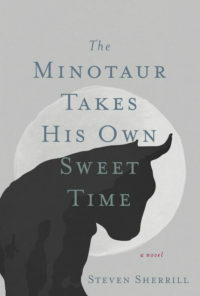 The Minotaur wakes without an alarm clock and always has; he wakes in the dead center of his narrow bed. He lives in a mobile home haphazardly furnished by the long-dead wife of his landlord, one dilapidated trailer among five laid out end to end, horseshoe fashion, around a small plot of crab grass, mimosas and dogwoods, also left over from the wife. Lucky-U Mobile Estates lies on the outskirts of the city, beyond most zoning laws, which are lax anyway. Sweeny, the landlord, lives in a brick house at the head of the washed-out gravel drive. On a small deck listing to one side at his back door, he frequently sits during the evenings, in his underwear, one pale bony leg draped over the other, drinking beer from a can, belching and overlooking his domain. The trailer is old and cramped, not designed for the likes of the Minotaur. He lies in the center of his bed vaguely remembering a time of more space. A time even before beds. But those memories are fleeting, nebulous. They fill him by turns with melancholy and a vague terror. Summer heat, undaunted by night, overpowers the oscillating fan on his chest of drawers. The air is so humid it's almost visible; the topsail of the boat in the framed photograph seems to flutter. The sheets and the Minotaur's pajama pants are damp from sweat. A baby-blue chenille bedspread lies bunched on the floor, kicked away during sleep. A dog barks outside his window. "Buddy! Shut up!" Sweeny yells from somewhere inside his house. Buddy, a wheezing piebald English bulldog, does in fact stop barking. Without looking the Minotaur knows Buddy is pacing back and forth on the concrete floor of his narrow chain-link run. Without doubt he knows that Buddy will start barking again in a few minutes. The dog run is small. The low wooden shelf offers little shade from the sun. Buddy's only distraction is half of a chewed basketball. The Minotaur understands completely Buddy's need to bark. This is the poem that inspired The Minotaur Takes a Cigarette Break.